The Review has now concluded and the final report was submitted to the Attorney General on March 31, 2017. I want to take this time opportunity to personally thank everyone who participated in this process. Your contributions have been invaluable. I am very hopeful that your input will result in a more transparent, accountable and effective civilian oversight system in Ontario. Stay in the know. Learn more about the process and get updated information. In case you missed them, you can watch our past consultations below. Make recommendations on how to enhance the transparency and accountability of the police oversight bodies while preserving fundamental rights. Ensure the police oversight bodies are effective and have clear mandates. 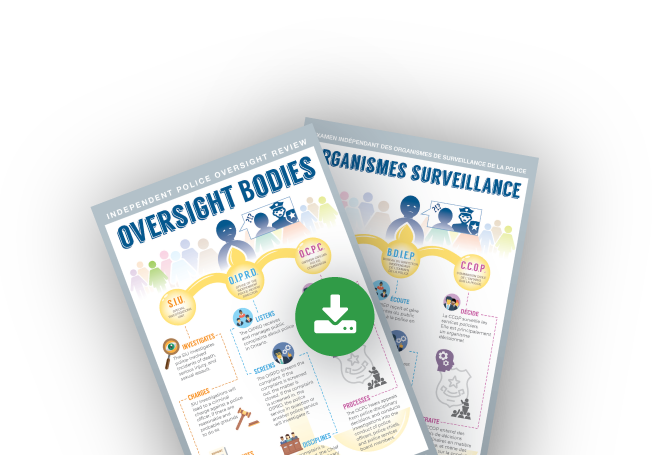 Reduce overlap and inefficiencies between these bodies. Read the full order in council for the Review, which outlines the complete mandate. Thank you to all who came out to our public consultations. Please see below for all of the places that we visited. 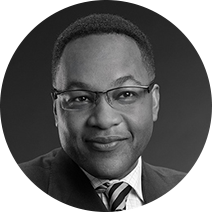 Justice Michael H. Tulloch was appointed a judge with the Ontario Court of Appeal in June 2012. Prior to his appointment with the Ontario Court of Appeal, he was appointed as a judge to the Ontario Superior Court of Justice in 2003 and presided in the Central Western Region of Ontario. Throughout his judicial career, he has presided over all types of cases and conducted numerous civil and criminal jury trials, summary conviction appeals, and divisional court appeals. Justice Tulloch attended York University in Toronto, and Osgoode Hall Law School. After graduating from law school in 1989, he became an assistant Crown Attorney in 1991, and later worked as a private defence lawyer. He has served as a special prosecuting agent of the Canadian Department of Justice, and participated in a number of reviews and commissions including the Ontario Government Review of Civilian Oversight on Policing, the Review of the Ontario Legal Aid Plan and the Criminal Code Review. Hilary Blain has been working for the Ontario Public Service in various senior policy positions since 2006, at ministries including the Ministry of Finance, Ministry of Aboriginal Affairs and Ministry of the Attorney General. Ms. Blain earned her Bachelor’s degree in History from the University of Guelph, her L.L.B. from Western University and her L.L.M. from Osgoode Hall Law School. Jamie C. Klukach has been counsel at the Crown Law Office – Criminal (Attorney General of Ontario) since her call to the bar in 1989. She practices exclusively in the area of criminal law with focus on appellate litigation. She is the Criminal Law Division and community contact on hate crime. She is actively involved in continuing legal education and has been an adjunct faculty member at Osgoode Hall Law School since 2000, teaching courses in criminal procedure, sexual offences, evidence and the law of homicide. She earned her Bachelor’s degree at the University of Toronto and her LL.B. at the University of Western Ontario. Danielle Robitaille is a partner at Henein Hutchison LLP. She practices in the areas of criminal, regulatory and disciplinary litigation at both the trial and appellate level. Ms. Robitaille earned her Bachelor’s degree at the University of Toronto and her LL.B. at Dalhousie University. She was admitted to the bar in 2007. Jodie-Lynn Waddilove is an Anishinabe (Ojibway) and Luunape (Delaware) lawyer from the Munsee-Delaware Nation. She joins the Review from the Ministry of the Attorney General, Aboriginal Justice Division. Previously she served as Counsel within other Divisions in the Ministry of the Attorney General and in private practice. Ms. Waddilove earned her Bachelor’s degree from the University of Western Ontario; her Masters Degree from the University of Sheffield in England and her LL.B. from the University of Ottawa. She was called to the Ontario bar in 2004 and the Alberta bar in 2006. She has also served as an elected Councillor for her First Nation. Matthew Parker joins the Review from the Department of Justice, having previously worked in private practice at a large law firm and clerked at the Supreme Court of Canada and the Court of Appeal for Ontario. Matthew is a graduate of Queen’s University and Harvard University. He was called to the bar in 2013 and is admitted to practice law in Ontario and New York. Justin Reid graduated from the University of Windsor, Faculty of Law. While at Windsor Law, he served as editor-in-chief of the Windsor Review of Legal and Social Issues. He also worked on a project that promoted access to justice in the Palestinian areas. Following his call to the bar in 2015, Justin clerked at the Court of Appeal for Ontario for Chief Justice Strathy, Justice Rouleau, and Justice Tulloch before joining the Review. Christine Mainville is a lawyer with Henein Hutchison LLP. She represents clients in criminal, extradition and regulatory proceedings, in both English and French. Christine has appeared at all level of courts in both Ontario and Quebec, as well as in the Supreme Court of Canada. She completed her law degree at McGill University, and obtained a master’s degree in Comparative Criminal Law from the Université de Paris I (Panthéon – Sorbonne). She also holds a Bachelor’s degree in Criminology from the University of Ottawa. Christine was called to the Quebec Bar in 2007 and the bar of Ontario in 2011. Danielle Dowdy is a business professional with extensive experience areas of strategic planning, community development and youth employment. Passionate about community service, she has spent over 20 years working across communities in a variety of community organizations. She’s presently on secondment from the Toronto Police Service, where she works as an Analyst with the Community Safety Command. She has worked in several areas of the Service including Human Resources, Staff Planning & Community Mobilization, and Diversity Management & Inclusion. A graduate of York University, Danielle holds an Honours BA in Economics. Pamela Grant is a seasoned executive leader and community advocate with an eclectic professional and volunteer background in Canada and internationally. Her career spans nearly 35 years in diverse leadership roles in the private, public and social service sectors. She is known for her expertise in and passion for transforming systems, through collaboration and partnerships, to bring about positive outcomes for racialized communities, women, youth, newcomers and other equity-seeking groups. She recently returned to her native Guyana as a Cuso International volunteer advisor to the Georgetown Chamber of Commerce and Industry and Cuso Guyana on youth entrepreneurship. Peter Rehak has used his wide-ranging experience in journalism and television production in the service of public inquiries, including the Walkerton Inquiry, the Independent SARS Commission, the Ipperwash Inquiry, the Toronto Computer Leasing Inquiries, the Pediatric Forensic Pathology Inquiry, the Mississauga Inquiry and the Elliot Lake Inquiry. Chioma Ijioma joined the Ontario Public Service in 2006 and has since accumulated extensive work experience in policy development, program and project management, and business and fiscal planning through positions in the Ministry of the Attorney General, Ministry of Government Services (now Treasury Board Secretariat), Cabinet Office and the Ministry of Municipal Affairs and Housing. Ms. Ijioma holds a B.Eng. in Communications Engineering from the Federal University of Technology, Owerri in Nigeria and an M.Eng. in Engineering Management from the University of Ottawa. Breanna Anderson has held various administrative positions in the Ontario Public Service and most recently provided executive support in the Agency and Tribunal Relations Division, Ministry of the Attorney General. Breanna has a Honours BA in Biological Science and Management from the University of Ontario Institute of Technology. Simon Igelman recently graduated from Farleigh Dickison University with an undergraduate degree in Business Studies. He previously worked as a product manager for a technology company. He has a special interest in law and social reform.